What is Kilim or Kelim? Kilim Rugs are woven carpets which are mostly produced in Anatolia. 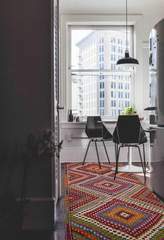 Kilim is a generic name for flat woven area rug which are mostly produced by inspiration of the weaver. Vintage Kilim Rugs do not have a pile since they are woven and not produced with nodes. In many parts of Anatolia, the culture, traditions and customs of a region are reflected on the kilim rugs, saddlebags and sacks . Motifs, colors and patterns are reflections of the weavers state of mind. Anatolia is famous for oriental rugs and the carpets often carry the name of their village of origin (Esme, Karasu, Emirdağ), sometimes combined with the name of the tribes (Avsar, Berihan, Kirkitli). 1. Animal Motifs: While the bird motif is the most widely used, different bugs and dragons are also used as motifs on carpets and kilims. 2. Plant Motifs: Tree, leaf, flower and fruit motifs 3. Geometric patterns: The most common shapes, triangle, square, rectangular, and equilateral rectangular shapes. Geometric patterns are especially popular since they are the easiest to weave. 4. Symbolic Motifs: Motifs symbolizing the forces of nature and reflect the feelings and thoughts of the weaver.Especially popular is the special name of "Çengel şekilli süsleme", symbolizing the “bad eye”. 5. Mixed Motifs: Medallion, pin, hook, columns, articles, letters, vases, etc. Showing 289 to 315 of 315 items.